I absolutely love coleslaw. I could eat it as a side dish or eat it as a condiment on top of about anything. However, I never know if the coleslaw that I buy at a restaurant is going to be too creamy. 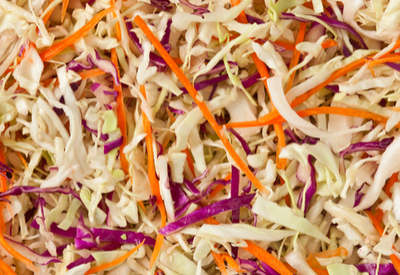 You can shred your own cabbage and carrots or buy a shredded bag of coleslaw mix. You know the kind that I mean. The one that is drenched in a mayo mixture that you have to rescue half of the coleslaw that is in the bottom of the bowl from all the liquid. And before you can take a bite you have to drain the liquid off each forkful so it doesn’t splatter everywhere. Don’t get me wrong, I don’t mind some creamy coleslaw recipes. However, the last thing I want my coleslaw to taste like is a big glob of mayonnaise. On the other hand, I don’t prefer my coleslaw tasting like pure vinegar. A little goes a long way with vinegar because of its strong taste. So just like Goldilocks and the three bears, I want it ‘just right’! Coleslaw with the perfect mix of mayo, vinegar and sugar. So I developed a coleslaw recipe that contains the perfect combination of mayo to vinegar. The recipe originated from my good friend Bev. I was at her house for a cookout one Sunday afternoon and I loved her coleslaw. I asked for her recipe and made my own small modification to make it my own. The best part of this recipe is that it can be easily modified to fit your dietary needs. If you are sugar-free or vegan, this recipe is easily adapted. For those that are sugar free, I have used packets of Stevia in place of the required amount of sugar. However, I prefer to add 10 packets of Stevia when the recipe calls for 1/2 cup of sugar. I find the recommended conversion rate of 12 packets to replace 1/2 cup of white sugar is too strong for my taste. However, you can always add more or less depending on how sweet you like it. And for the vegan version, instead of adding traditional mayonnaise, use a vegan mayo. My favorite replacement mayo is Just Mayo. It has all of the flavor of traditional mayo without using animal products. Coleslaw isn’t just a side dish anymore. 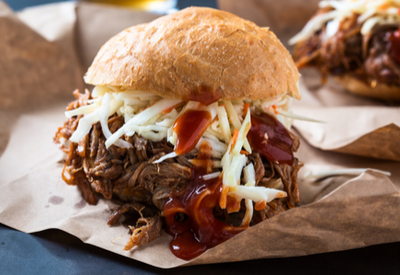 Try it on top of your favorite sandwich! 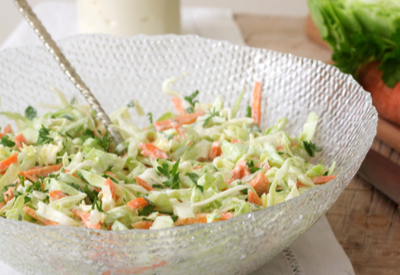 Don’t forget – coleslaw is not just a side dish to the perfect barbecue meal. Get creative and use it on top of your favorite sandwich, hot dog or on top of your favorite cooked fish. I have even used it as a nest inside my street tacos! Shredded cabbage and carrots tossed with the perfect balance of mayo, vinegar and sugar. Can be easily adapted to make it sugar free and vegan friendly. In a medium bowl, whisk together the mayonnaise, vinegar, water, and sugar. Set aside. 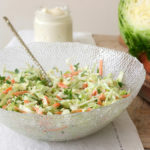 In a large bowl, add the bag of shredded coleslaw mix. Add mayo/vinegar mixture. Toss to coat.